A Powder Keg of Spiritual T.N.T.! Living a naturally supernatural lifestyle is easier than you think. T.N.T. is a guidebook that teaches you how to live a naturally supernatural lifestyle, expressing and demonstrating the Kingdom of God wherever you go, to whomever you meet. It is an easy, fun, strategy to help you launch out in your supernatural destiny as a world changer and revivalist. Treasure Hunting is an exciting model for witnessing that uses words of knowledge as the clues to find people God wants to bring into His Treasure Chest  His Kingdom. The Holy Spirit has highlighted on the Treasure Map, people who need a divine encounter of His kindness expressed in signs and wonders, miracles and healing. Treasures may be hiding in your family, friendship network, neighbourhood and workplace! As believers risk finding the lost Treasures, churches are springing up in Muslim countries, as well as many other parts of the world. Missionaries in the Far East are using the Treasure Hunt to find and remove child prostitutes then showing them the love of God. So, dont wait another day to become a Treasure-Hunter fuelled with TNT. As you begin your training, you will be empowered to step out of your comfort zone, cross the chicken line and give it a try! 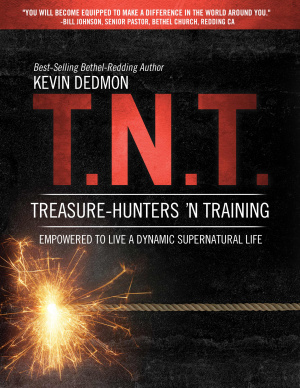 Tnt by Kevin Dedmon was published by Destiny Image in July 2012 and is our 21019th best seller. The ISBN for Tnt is 9780768441192. Be the first to review Tnt! Got a question? No problem! Just click here to ask us about Tnt.